In Northwest California, like many Native cultures, societies were egalitarian where the roles of women and men were balanced. Women had religious, political, and economic power that was equal to the power of men. Women served in leadership positions as medicine women and could also be the primary owners of dance regalia. Native women were not only leaders in politics and community but they were also central to the cosmologies and ceremonies. In particular, numerous tribes in California practiced women’s coming of age ceremonies. 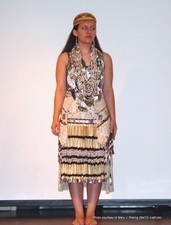 The regalia pieces worn by women represent various aspects of their cultures. 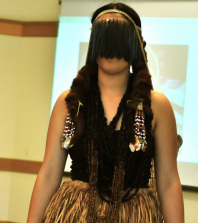 In Northwest California, regalia is often made of natural materials that are a part of the landscape. This demonstrates the integral relationship that these peoples had with their land and resources. In addition, Native peoples would often trade for other materials to include on their regalia pieces. In this section we invite you to explore various women's regalia pieces from Northwest California.